Yesterday was the release of Adi Alsaid's second book, Never Always Sometimes. It's about two high school seniors and best friends who created a list of clichéd things they definitely would NOT do in high school during their freshman year, only to arrive at senior year and find that maybe they should break their own rules and tackle everything on their list. To celebrate the release, Adi stopped by to answer a couple of questions! TCR: What's one (or more) high school cliche you think readers shouldn't skip out on? Adi: Parties, dances, yearbook club, anything that leads you to more contact with more people. Definitely be silly, pursue the stupid ideas you get (that won’t get you killed or seriously hurt) that adults will think are stupid and other people will think are weird. TCR: Did you ever do any of the things on Dave and Julia's list when you were in high school? Adi: I definitely pined silently, though my crushes didn’t really last all of high school. And my lunch spot was usually the same, when I wasn’t being a cliché athlete and playing basketball in the gym, sneaking bites between games. TCR: What's your favorite part about the writing process? Least favorite? Adi: Getting to do it is my favorite part. Least favorite is the self-doubt that often comes along at some point, usually in revisions. But the self-doubt usually leads to creating a better book, so I don’t mind it that much. TCR: What's one thing you didn't do in high school that you wish you had? Ari: Speak up. I was shy and not very talkative outside of my little group of friends, and though I can still be quiet, I learned later in life that I wanted to be hanging out and talking to more people, I had things to say I kept to myself. 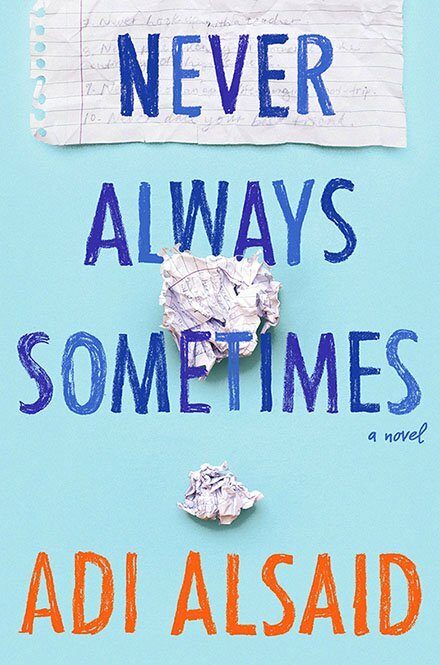 Never Always Sometimes is available now!